Might be tight early, question is will CD be able to maintain pressure for the total game ? You would think Norwood but its too early after just one game has been played to know how we are travelling. Wouldnt be surprised if its a lot closer than people may think. Norwood are suspect kicking goals and if the Dogs kick accurately they are in with a good chance. Mannyredleg you are being way to cautious everything that Bayman says is spot on .I hope we just have a crack and a 4 goal loss will be a good effort.Simply we are not good enough with what we showed last week. Can't see Centrals winning either,unfortunately that home ground advantage doesn't mean much if you don't have the talent. No quality key forward,a 19 year old ruckman who's not ready for league footy and an average backline. When will Roy stop picking Haydon,he's too small and offers no rebound from the backline. Surely we cant expect Tim Auckland to compete on his own against Baulderstone huge ask for a 19yr old. You'd hope not,maybe M.White will come in. I still don't understand why we recruited 3 ruckman. Jars74 wrote: Can't see Centrals winning either,unfortunately that home ground advantage doesn't mean much if you don't have the talent. Fair enough to recruit a young ruckman if no local talent ready but after losing Fort to Geelong I would have thought Hannath should have been retained (not aware of any issues between player/coaches). I watched the South game over a couple of times and Menzel looked dangerous when he was given decent service. Most of the service by mids and back flankers into forward line was pretty substandard and boarded on panicking. That would be the key area they need drastic improvement on. Saying that, I thought South looked skilled and organised and might just have a better year than some have suggested. I was surprised to see Hanna and McKenzie in the two's, are either or both coming back from preseason setbacks? I think Hanna can play either end of the ground and McKenzie coupled with Menzel could just cause some serious headaches forward with a fair share of service. It's not all doom and gloom but the squad has definitely got some work ahead of them. Why all the panic with Centrals after 1 match. Many sides with struggle at souths ground. Central had a good preseason and at the Ponderosa will cause problems to all sides. goddy11 wrote: Why all the panic with Centrals after 1 match. Many sides with struggle at souths ground. Central had a good preseason and at the Ponderosa will cause problems to all sides. Think from memory Centrals accounted for North comfortably in round 1 last season? Things can change - and quickly - over the course of the season. 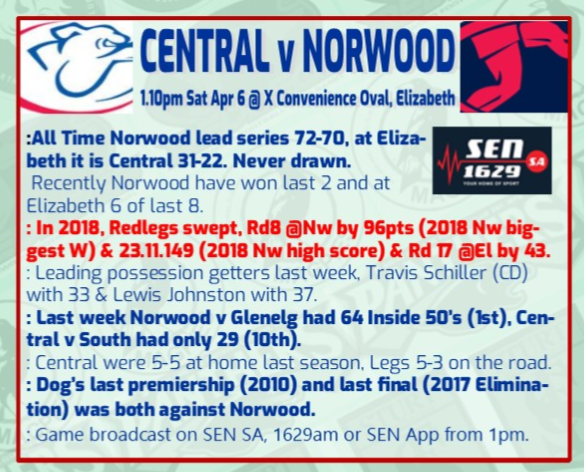 I'm sure we'll see a response from Central, and I think Norwood are questionable under high pressure levels. If Norwood are able to execute properly though, you'd think they might have a few too many weapons. Interesting game coming up. Reddog Isaya McKenzie was coming off injury dont know about Sam Hanna. Hopefully Roy will pay a little more respect to Norwoods mids. Last week just let Cross and Liddle do what they wanted. Norwood should win this comfortably you'd think. Even the wide expanses of the Ponderosa wont stop them having a 5+ goal win. If we play like last week it will be at least that and more. Never happy to lose but to go down by only 3 pts was a great effort against Norwood . Where was the fourth quarter effort early & last week? How much did that shot miss by ? Very kind words Bayman and I appreciate it, but many good SANFL commentators bringing the game to listeners. Between SEN, Life FM, Seven and the Digital Pass, great to see many options for fans.